Imagine for a moment that your worst nightmare has come true. For me, that would be Netflix taking The Office out of rotation. (We had a scare last week.) For those who are married, I assume that would be the death of your spouse. Let’s make that nightmare worse — your recently deceased spouse was a member of Congress. Suddenly, you’re a widow, maybe a single mother, perhaps you’ve lost your family’s sole breadwinner, and you’re dealing with the death of a very public figure who happens to be your husband. Suddenly, at your lowest moment, you’re thrust into the spotlight. I know what you’re thinking: now seems like a great time to run for office. For a very long time, this so-called “Widow’s Succession” was the most common way women got elected to office in the U.S. There have been eight women appointed to the Senate and 39 women elected via special election to the House of Representatives to fill the seat of their late husbands. That’s 16 percent and 13 percent of all women that have ever served in the Senate and the House, respectively. The practice reached its peak in the mid-20th century, but there are still remnants of it today — California Representative Doris Matsui was originally elected to replace her late husband in 2005. She has since been elected on her own merits five more times. When the practice first got its start, that wasn’t the idea at all. The grieving widow was supposed to be easily elected or appointed to keep the seat warm — and the party unified — until the real election came around. Then she could go back to playing mah-jong or talking about her emotions or whatever it is women do. And that’s totally what all the women did. Hattie Caraway became the first woman elected to the Senate after she won a special election in 1932, after the death of her husband, Arkansas Democrat Thaddeus Caraway in 1931. Then, she shocked everyone by running for — and winning — a full term later that year. Another widow’s succession trailblazer was Margaret Chase Smith, who turned the death of her husband into an eventual run for president. Smith’s husband, a Republican Congressman from Maine, was preparing her to run on her own merits in the next election — which he thought he’d be too sick to participate in. He said, “I know of no one else who has the full knowledge of my ideas and plans or is as well qualified as she is, to carry on these ideas and my unfinished work for my district.” (Um, marry me, Clyde Smith!) Unfortunately, this feminist ally died before his term was up, so Smith had the chance to try that out earlier than planned. Smith became the first woman elected to the House of Representatives from Maine, and after she was elected to the Senate, the first woman in the country to serve in both houses of the legislature. In 1964, she ran for President against Barry Goldwater, saying, “When people keep telling you you can’t do a thing, you kind of like to try.” She didn’t win a single primary but was the first woman to be listed as a possible candidate at a national convention. 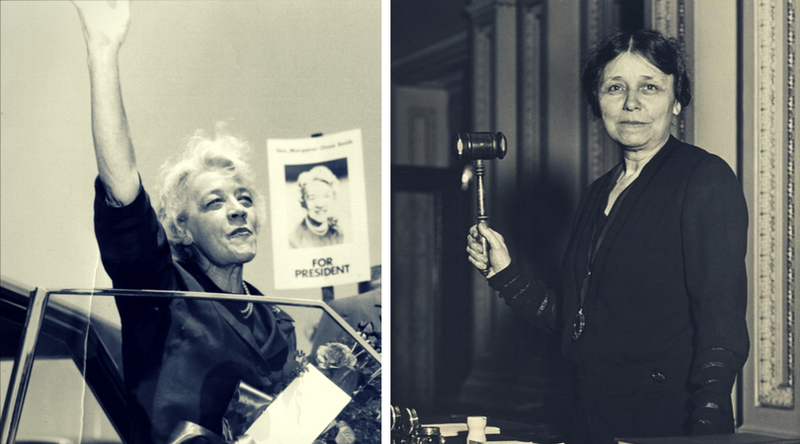 Thanks to trailblazers like Hattie Caraway and Margaret Chase Smith, women no longer need to wait for their husband to kick the bucket to assume office. Now, they just need deep pockets and the world’s thickest skin. Twenty percent of the U.S. legislature is women today, and none of them are there only because they outlived their spouse.